1. Captives by Angela Meyer, received from Inkerman & Blunt along with 3 stunning bookmarks just for liking their FB page. 2. A Christmas Carol and Other Christmas Writings by Charles Dickens. 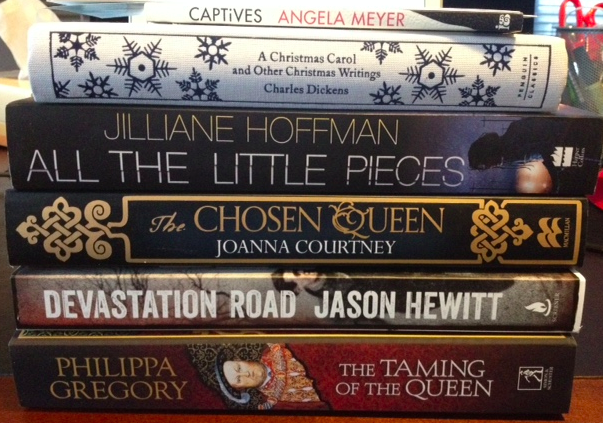 Purchased from Boomerang Books using vouchers earned by writing for their blog. Love these clothbound editions from Penguin! 3. All The Little Pieces by Jilliane Hoffman, won in a competition hosted by Booklover Book Reviews. Thanks Jo! 4. The Chosen Queen by Joanna Courtney, courtesy of Pan Macmillan Australia. When I finish reading this one, I'll have an opportunity to interview the author. 5. Devastation Road by Jason Hewitt, courtesy of Simon & Schuster. 6. 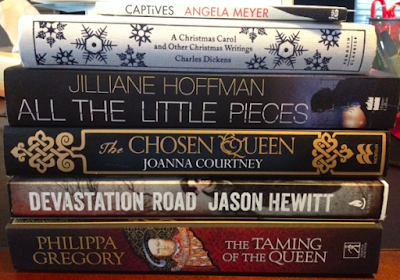 The Taming of the Queen by Philippa Gregory, courtesy of Simon & Schuster. I can't wait to read this one, it's about Kateryn Parr and is available to the public next month. I usually read 1-2 books per week, so this haul will take a while to get through, and will definitely boost my TBR pile. If you're interested in any of the books pictured above, just click on the titles with hyperlinks for more info. The pleasure was mine Tracey. Great haul there - first time I've come across Devastation Road, sounds like an interesting take on the wartime novel, I look forward to your review.